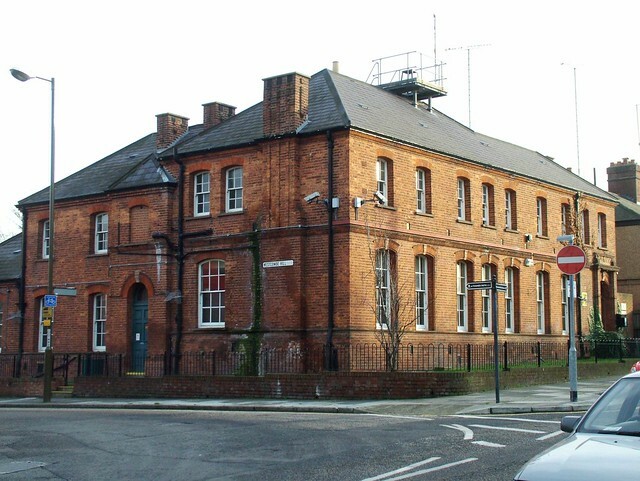 Westcombe Park: Abandoned Police station = more local crime? First off, I found an iPod Nano and a CD on the street, and as I was passing I wanted to hand them in to the nearest station so they can be claimed as lost property. With finds like these, one never knows if something was just dropped accidentally while running to catch a train or bus, or whether something more sinister had taken place. Walking up to the front door (shown far right, in the picture above) it was clear that there is no public-facing service, so it seemed pointless to knock on the door. The phone thoughtfully provided outside doesn’t have any instructions and looks in a dire state of repair – there didn’t seem any point in using it. I just left the goods in a plastic bag on the doorstep. Four days later it was still there in the same place. At least the yokels apparently didn’t think it fair game to pinch something off that particular doorstep! Then there was the incident a couple of nights ago at the local train station, with trains diverted while a knife was apparently recovered from the tracks. It’s not terribly encouraging to know that quite a nasty fight apparently took place in what is otherwise quite a nice suburb, only a block or two away from a now “closed” police station. It makes me wonder whether having the station back in use for the public and serving as a base for regular visible foot patrols would help prevent this kind of thing becoming a more regular feature. We humans are shallow creatures and the presence of a police station in an area, even when disused or non-public-facing, seems to make at least some of us think twice about our actions and how they’re coming across. In this case, the fact that the building is overgrown (more so now than in the above pic, taken in 2009 apparently) and has had a leaky overflow pipe with moss growing all over the wall underneath it for two or more years, the building doesn’t come across as one that actually performs any function whatever story the office lights and car movements around it might try to tell. Perhaps if someone fixed the leak, cleaned up the wall, tidied the phone booth and cut back the overgrowth around the front door, passers-by might actually think there’s a real presence there and modify their behaviour accordingly? Sure, it won’t stop the worst offenders, but it might at least make them think twice about the fact that someone might catch them. And perhaps it might make the locals feel more like a police presence is nearby. Next Post Text scam – ignore and/or delete without reading. It’s been effectively closed to the public since at least the late 1990s – it’s frustrating if you find things in the street and just want to hand things in…. I lived opposite it for many years – when it was open, the garden was immaculately kept. It’s served a few functions – pre-Belmarsh, high-profile defendants were occasionally held there during major trials because it was such an obscure station. More recently it’s been a base for safer neighbourhood teams. Now much of the Greenwich borough police operation is centralised at an industrial unit in Warspite Road, Woolwich. The police wanted to sell it at one point – I imagine that the economic downturn put paid to that. As I just said elsewhere the Peninsula Safer Neighbourhood Team Operate from there and are approachable by phone and email. They are generally pretty responsive. I think there are also some specialist units there. As Darryl says it has been closed as a ‘desk’ for many years. There have been several plans to relocate both the station and the team but there have been hold ups – I’ve lost track of what they are – but I could find out if you liked. Inside it is pretty grim – lots of steep staircases and tiny rooms. Also as Darryl says the garden used to be beautful – down to a long departed sergeant I understand. The next door garden full of police gnomes also seems to have been cleared …………………. I think they go in and out of the gate at the side. From what I recall, while stood outside that building I’d have had no idea that the occupants were indeed the Peninsula Safer Neighbourhood Team, nor that they could be roused by ‘phone or email. If people are still working there, then why is the outside of the building being left to go to rack and ruin? Fixing a leak surely is cheaper than cleaning and fixing the brickwork and paying higher water bill after leaving it be for three years or more. It’s all very well a bunch of us recalling fondly how it used to be – but what can actually be *done* here?